Markets in Guildford were traditionally held in the open on the high street. The corn market needed to be protected from the rain, however, and was thus held beneath the overhanging of the first floor of the Guildhall. As the market grew, a wooden canopy was set up outside the Tuns Inn to accommodate the market. 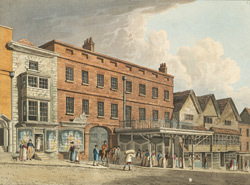 By 1818 the inn had been demolished to make way for the new Corn Exchange.